Roberto is looking forward to his birthday because it will bring cascarones! During the year, his Mom has collected dozens of eggshells to fill with confetti and decorate for the party. Roberto and his mom spend many happy hours preparing the colorful shells—something that parents reading this book may choose to do with their own children. But on the day of the party, little Roberto wakes ups to find his cascarones gone. 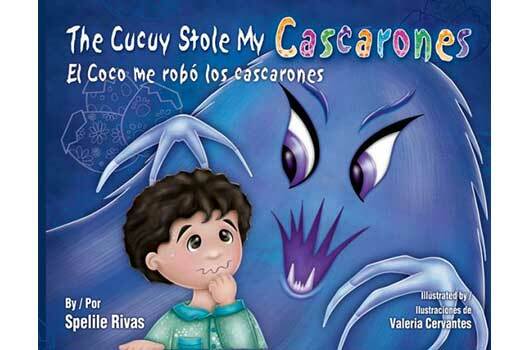 Surely, the Cucuy has stolen them! Roberto notices a trail of confetti and decides to track down his cascarones even if it means encountering the fearsome Cucuy. To avoid alarming his mother, he decides to follow the confetti trail on his own. Despite his fears, Roberto marches on. He stops by the tamales store, and learns that his birthday tamales are gone, too. At the bakery, his cake has disappeared. At the next shop, his piñata turn up missing too. With every step, Roberto acquires a little more courage. Finally, he reaches the park, where he finds a birthday surprise! Proud of himself, Roberto learns that courage means persevering, and facing our fears.